What do you do once the kids are in bed? Some nights Eric and I simply collapse, as the bedtime routine was particularly hard that night. We often have to finish the dishes as the dish fairies forgot to come after dinner. We will often watch a movie, but we have to find the 90 minute ones, other wise we will just get to bed too late. So that usually means a chick flick or scary movie as those seem to be the only short ones. And sometimes we play games. For a while (several months) we just played just one game. Eurorails For anyone that likes long strategy type games (any Settlers or Carcassone fans) you should check out Eurorails (or Empire Builder if you want the United States instead of Europe). Eric and I began playing it about three years ago. After a few nights of playing I insisted that I had won more games, he was insistent that he was the winner. So what did we do? We created a spreadsheet (hmmm we both are geeks I guess). We created a spreadsheet to keep track of who won. It took us a couple of years to finish this series. And ladies and gentlemen, I am the Eurorails Champion! anyone have any favorite games? Whoo hoo to the winner!! I looove games - we are all wicked competitive here. OF course with my brainiack husband and son..they work me hard for a win!! My kitchen fairies threw in the towel when I became PG with #3!! Euro Rails, British Rails, Empire Builder, Australian Rails, I think I may be missing one or two. All very good games. Yeah, you guys are geeks making a spreadsheet but a TRUE 100% Geek, would realize what you are doing is making a Database and wipe open MS Access and create a D-base and not only store the wins, but also the number of turns, number of connected cities (all size cities) final currency count, what turns train upgrades happened, what turns the final large city connections happened. Then, you have to make a forumla to weight all of those and determine who is the true winner. Those are the ones I think of off the top of my head. There just are not that many 2 player games I have and play regularly, other than Blood Bowl and that is probably more complex than you and Eric would like to play. I'll have to recommend this to my sister in law. She loves Settlers and Ticket to Ride. This sounds like its right up her alley. Rachel, Settlers and Ticket to Ride are an much easier game than Eurorails. Just be pre-warned. Settlers is a 1-1.5 hour game and Ticket to ride is a 30-60 min. game. Eurorails is easily 2 hours+. 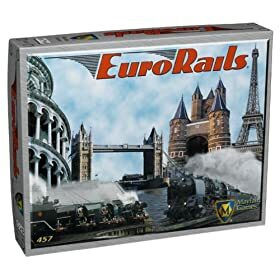 It crosses a line between casual gamer to intermediate games in my mind so just in case your impression of Euro rails was it was the casual game (like Settlers and Ticket), Iwanted to make sure you knew. My wife will play Settlers and Ticket, but she will not play the Eurorails games. She is a casual gamer. If your sister is casual only, like my wife, then she may not like this game. If she can play a 2 hour + game, then definitely recommend it to her as it is a good game. My husband and I are too competitive to play games with eachother. For our wedding we received a bunch of card games which came in pretty handy because we didn't have a TV for a couple months. After the first couple nights of who-beat-who I vowed never to play a game with just him again. But with a crowd we love, Loaded Questions, Apples to Apples and Blockus. My husband and I really like to play Ticket to Ride and Blokus. Our favorite game to play with the kids (adults love it also) is Toss Your Cookies.